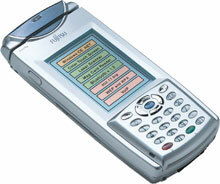 The Fujitsu iPAD has been discontinued. No direct replacement is available. Perform line busting, assist in sidewalk sales, verify prices, conduct inventory control, page store managers and more! What if you could significantly improve customer service and efficiently handle a range of in-store applications all with one lightweight device that fits in your palm? It's simple with the mobile Fujitsu iPAD. This all-in-one system lets your store associates assist customers from anywhere in the store. It's ideal for verifying prices, setting up instant checkouts, paging managers and much more. The iPAD also gives store managers real-time data at their fingertips. They can review reports, initiate store transfers and monitor POS transactions for loss prevention activity from anywhere, allowing them to spend more time in the store instead of the back office.